Psychometric properties of startle and corrugator response in NPU, Affective Picture Viewing, and Resting State tasks. Psychophysiological tasks are poised to become a major contributor to the National Institute of Mental Health (NIMH) – Research Domains Criteria (RDoC). RDoC provides a novel framework to understand mental health by examining “basic dimensions of functioning underlying the range of human behavior from normal to abnormal” (RDoC website, 2017). Psychophysiological tasks may tap RDoC constructs at a level that can bridge critically between other units of analysis such as neural circuits, behavior and self-report. For psychophysiology paradigms to meaningfully contribute to the study of individual differences within the RDoC initiative many researchers have called for a heightened attention to issues of reliability and psychometrics. Indeed, the rise of RDoC has coincided with increasingly widespread concerns regarding the robustness and replicability of psychological science broadly over the last few years. In this study, we evaluated two tasks that have been proposed as paradigms to study emotions within the RDoC framework: the No Shock, Predictable Shock, Unpredictable Shock (NPU) Task and an Affective Picture Viewing Task. We provide a comprehensive psychometric evaluation of two common physiology measures of emotional states in these tasks: corrugator and eyeblink startle responses. The corrugator supercilii muscle around the eyebrow is activated by many negative emotional facial expressions such as those expressed during fear, anger or disgust. The eyeblink startle response is an adaptive defensive reflex, which we measure via the orbicularis occuli muscle to capture the vigor of the eyeblink startle. We all understand these measures intuitively. If you are watching a scary movie and a gory scene appears you might scrunch up your eyebrow (via corrugator muscle). If someone in the scary movie is suddenly attacked, you may be startled (jump in your chair and blink). Our results suggest that startle response in the NPU task displayed reasonable psychometric properties (e.g., robust, reliable and stable). Therefore this task-measure pairing appears to be well-suited for single administrations as well as longitudinal or other research designs that include multiple administrations. 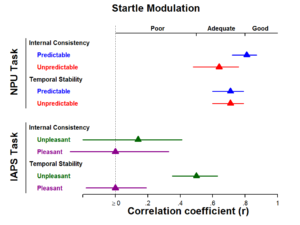 Both startle and corrugator modulation to pleasant pictures in the Affective Picture Viewing Task displayed poor psychometric properties across the board, raising serious concerns about the reliability of these measures with these pleasant stimuli. Other task-measure pairings all displayed a mix of acceptable and inadequate psychometric properties. Future research may help clarify the conditions under which the reliability of these task-measure pairings may be improved. This study adds to a growing literature aiming to improve the robustness, reliability and reproducibility of experimental psychology tasks. Psychophysiology tasks have a lot to contribute to the study of individual differences within the NIMH-RDoC framework, but it is essential that they are well-validated in order to help advance the field.